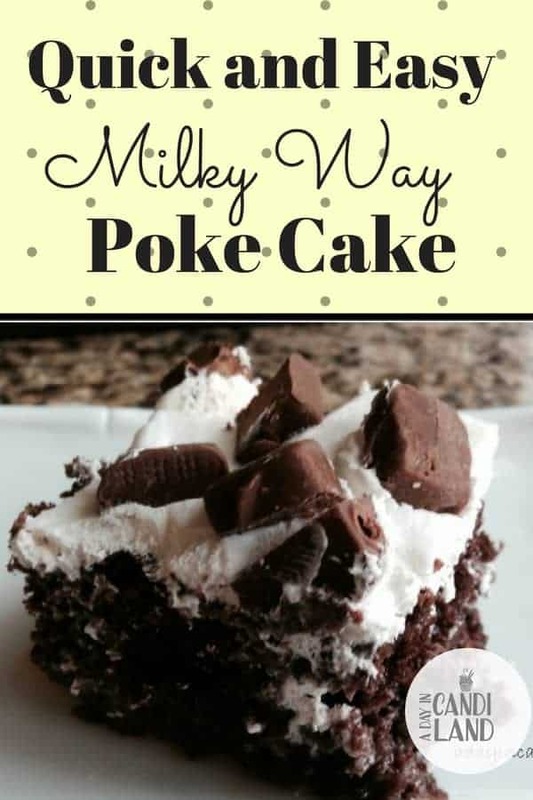 Milky Way Poke Cake is a delicious way to dress up a box cake mix and make a rich dessert. Poke Cakes are a delicious and quick dessert to make and there are so many variations you can create like the Poke Cakes I wrote about here. Are you looking to spend more time with your family and less time in the kitchen planning your menus for the month? 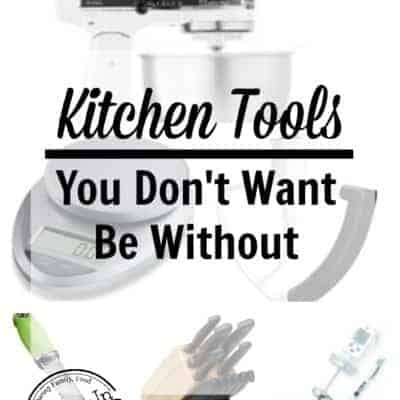 Are you tired of eating fast food and running out of idea options for your meals? If so sign up and receive your 30-day meal planning cheat sheets. I have a confession. I had never had a poke cake before this weekend and I decided I wanted to add one to my dessert recipes section. So I made this Milky Way Poke Cake on Sunday. My kids helped me make it by cutting up the Milky Way candy bars and from then they encouraged me to make Strawberry Cider Poke Cake and Red Velvet Oreo Poke Cake several weeks later. Get your kids involved in the process. It can be a great family activity. Now I usually make all my desserts from scratch and you could definitely do that but this awesome thing about Poke Cakes is they are known for using boxed cake mixes. This may be my new obsession. It only took two days for it to be completely gone. My kids asked the neighbors over and before I knew it, the empty cake pan was in the sink. The cake is super moist and I am sure you will be a Poke Cake junkie before you know it. A Quick and Easy Dessert recipe filled with creamy nougat and topped with a whipped frosting and Milky Way and Snickers Bars. Let cake cool for about 5 minutes. Poke holes in cake with the handle end of a wooden spoon. Evenly our and distribute *nougat filling into the holes in the cake. Next evenly pour and distribute caramel topping into the holes in the cake. Once cake is cooled completely, evenly spread thawed cool whip over the top of cake. Sprinkle chopped Milky Ways ( I also used snickers) over the top of cool whip. Have you made any poke cakes? I should have drizzled some caramel over the top but we ate it too quickly. This is a quick and easy dessert, that your friends and family will love. 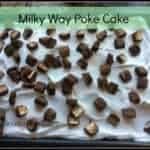 I hope you enjoy this Milky Way Poke Cake recipe and leave me a comment letting me know what your favorite Poke Cake flavor is. Oh. My. Goodness. I want to grab that and a fork! 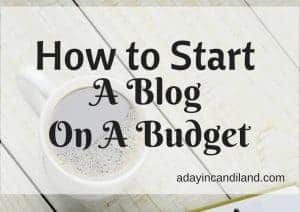 Looks awesome Candi, definitely going to pass this along! Yes, so good and easy. It might be my go to party cake when I have to bring something. Until I read your instructions I couldn't figure out why it was called a "Poke" cake! Ha! This looks indulgent— now wonder it was gone so quickly! There are probably a few calories, but I had one piece and the kids ate all the rest. Yummy! Good way to make use of leftover candy. Well, I don't know if we would ever have left overs in our house. But probably Halloween would be a good time to do this. Wow…this looks really good. I am on a dessert kick right now! I don't think it would last very long in our house! We're going to have to try it! If you have a moment, I'd love it if you'd come over and link it up at Foodie Fridays. Pinning it now! Thanks I will stop over. thanks for coming by my site. You are killing me!! This looks incredible!!! Thanks for stopping by, It was so easy, my kids had fun with it. Oh my. I have never heard of a poke cake but I like what I am seeing! thank you, I had heard of them but never made it till recently. Now there are a lot I want to make. Thank Megan for stopping by and visiting the blog. 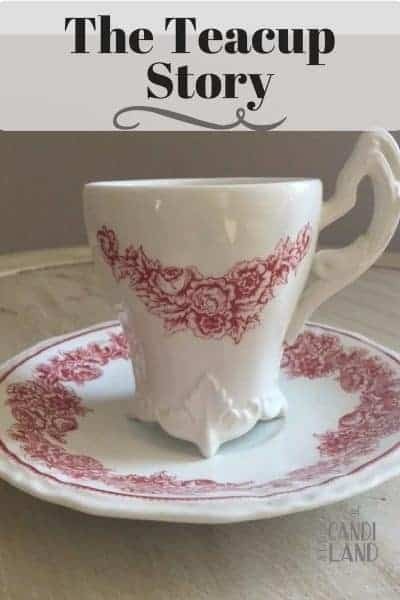 They are so easy and everyone will love it. It looks really yummy – but what I really want to know is why is it called a Poke Cake? My recent post Back to School: Are you thinking about your curriculum for next semester? You poke holes in it and put the filling inside.